The Kirt Brooks Scholarship Fund is a grant-making program for students who are engaged in the water environment field and who are members of CWEA or sponsored by CWEA members. CWEA established the endowment for an academic scholarship fund in 1988 with the main purpose of the program to provide educational funding assistance to individuals in the wastewater industry, to encourage continued education and to promote the water pollution control professions to outside groups and organizations including the academic community. When the idea of a scholarship program was conceived many years ago, Kirt Brooks became a member of the ad-hoc committee to define its objectives and selection criteria. It was renamed the Kirtland H. Brooks Scholarship in 1993. He saw the scholarship as a logical extension of the Association’s basic purpose of education of its members. Today it has provided over 100 outstanding students with scholarships thanks to generous donations from members like you. 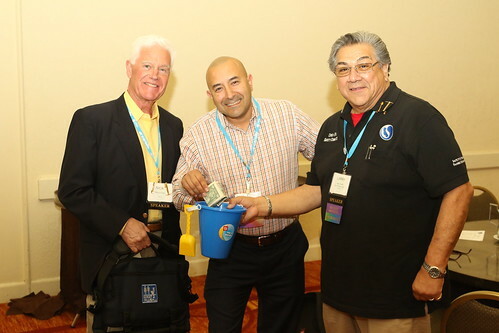 This year during the Annual Conference in Palm Springs, CWEA’s 5S members (Select Society of Sanitary Shovelers) and CWEA Local Sections collectively donated $24,539! Those contributions officially bring the donations over the $500,000 goal but we’re not stopping there! Scholarship donations are accepted throughout the year, not just at our Annual Conference. Kirt Brooks Scholarship recipients have gone on to serve the public in varied roles such as water quality lab analysts, engineers, university educators, pollution prevention professionals, regulators, utility managers, and operations and maintenance personnel. Scholarship applications for the 2018-19 school year will be available online in September. The application deadline is January 15—plan now for next year. Scholarship applicants do not have to be members of CWEA; however, they do need a CWEA member to sponsor them.